Tasmanian Platypus. Fern Glade near Burnie, possibly the best place to see wild Platypus in Australia. 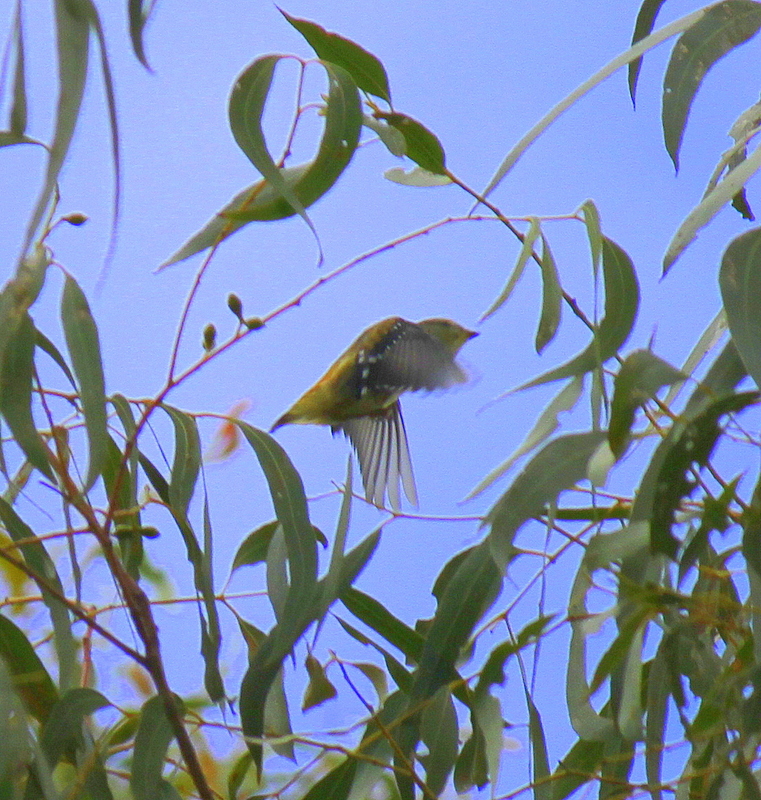 This report covers a 16 day birding and family (x2) holiday to sunny Tasmania in January 2013. From a ‘trip report’ context, I was a little concerned about covering the entire state in just one trip report. How could this possibly do the Apple Isle justice? Many of the places we visited could easily have had dedicated trip reports. Some areas you’d need to spend months there just to understand its ecological rhythms. So here goes, I’ll try to fit them in to just one rather long trip report. Wish me luck. The wildlife in Tasmania is reflected by the islands rich diversity of habitats: a fantastic, sometimes rugged, coastline, dry sclerophyll forest of its eastern half, extensive heathland on its west, and wet cool temperate rainforest across the centre. Being a family trip of course we swam at any good beach we found, and visited every chocolate shop, berry farm (great cherries) and cheese factory we past. However we also made concerted effort to visited Tasmania’s wonderful wild places, and Tasmania’s unique birds and wildlife were continually on our minds. From Melbourne we took the Spirit of Tasmania II car ferry to Devonport. The cost of taking our car (X-Trail) was extremely reasonable. Due to the subsidised ‘Bass Strait Passenger Vehicle Equalisation Scheme’, the car one-way for a 450 km ferry trip costs you just $89. By comparison the cost of a car to Kangaroo Island one-way cost $140, and the distance covered is just 20 km! The Tasmanian ferry cost is apparently designed to equate to price you’d spend on petrol if you drove the same distance. Having our car meant we could pack as much camping gear as we liked, plus the boogie boards, plus my reference books, the fancy camping chairs, including Tanya’s ‘moon chair’ (a Christmas pressies), and so on. So everyone was happy. During the trip we managed to circumnavigate the Apple Isles in 16 days. With a pleasant mixture of camping and staying in cabin style accommodation, out first stop was Burnie in north-west Tasmania, From there we travelled east to Bicheno for five days, south to wonderful Bruny Is for a few days, a day in Hobart town, then west across the islands’ centre to Strahan via Derwent Bridge, and finally north to Stanley and Rocky Cape National Park. For the most part, the distances travelled were relatively straight-forward. Why “Sunny Tasmania”? Tasmania has a reputation for cold weather ! During our stay we had sunny days for virtually our entire trip. The weather temperature ranged between 20°C and 25°C. Simply perfect. Note: we arrived in Tasmania in the second half of January, however in early January Tasmania experienced extremely hot temperatures, with several sites breaking all-time maximum temperature records. Hobart recorded a maximum of 41.8°C. First stop Burnie, staying in a cabin at Burnie Oceanview. Despite being a bit daggy, it was actually really good – and it had a glass-enclosed pool, great for the kids. The beach directly opposite proved excellent for Little Penguin, with ~40 strolling up the beach just after dusk. The main reason for staying in Burnie was to visit Fern Glade, a small, but delightful bush reserve 4 km east of town. From my experience it’s also the best place in Tasmania to see Platypus. To get there turn on to Old Surrey Rd on the western side of the Emu River Bridge, 1 km east of Burnie. After 350 m turn left on to Fernglade Rd and the reserves picnic area is another 1 km. Rainforest bordering the Franklin River. This was the second time I’d visited Fern Glade. The first was in the 1990’s, indeed it was the very first site I went birdwatching in Tasmania. Flying into Wynyard to attend a conference in Burnie, and at the end of the day I walked to Fern Glade. On this occasion several Platypus swam in the shallows so close to shore that you could touch them. I remember thinking about how large they were. In fact they were massive; by comparison to some of the Platypus I’d seen on the mainland, they were nearly three times the size! This certainly supported Bergmann’s eco-geographic rule that animals of larger size are found in colder environments. 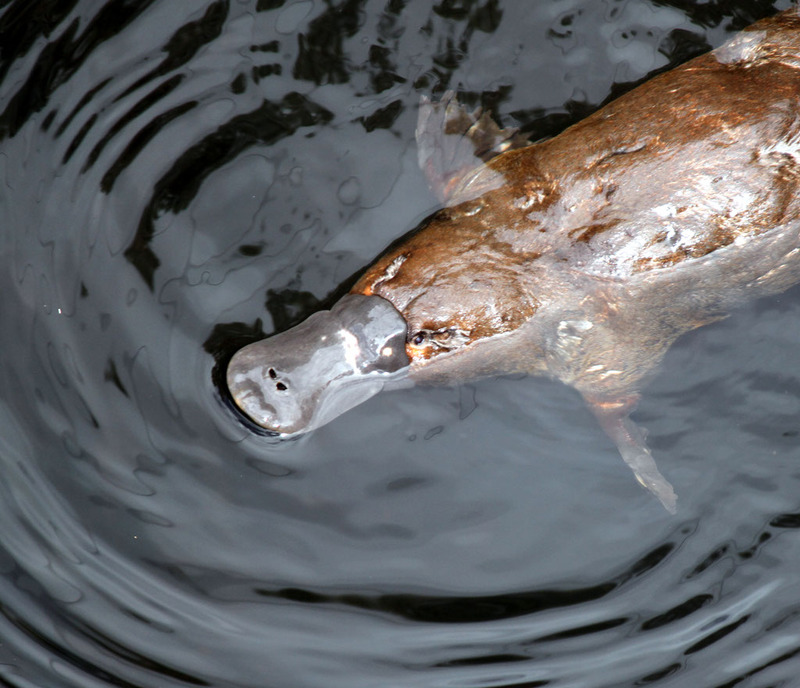 Although his theory was originally formulated in terms of size between different species, in the case of the Platypus (as with most mammals in Tasmania), the principle can been recast in terms of populations within the same species. The principle also applies to the Tasmania’s birds. The local Masked Owl (ssp castanops) is ~50% heavier than mainland birds. There are many more such example. To add one more to Bergmann’s list, I personally think the Blackbird is larger in Tasmania. Considering its relatively recent introduction, the size increase seems to have occurred in just a few generations. Anyway, my plan was to visit Fern Glade and show my family a few ‘dead cert’ Tasmanian Platypus. We arrived around lunch time and within an hour a very large male Platypus swam past the picnic area, and down the river. Not bad! Bicheno foreshore and Diamond Island (right), with Douglas Apsley National Park in the background. Birds. Like the previous time I’d visited Fern Glade, it was very birdy. Several Tasmanian Native-hen called noisily along the river bank. In 1998, I remember watching them in the same place. On that occasion they were having a massive brawl – indeed the fight was so viscous that I felt like breaking it up. Fern Glade is an excellent spot for robin, such as Dusky, Scarlet and Pink Robin, while other birds here include Yellow-tailed Black-Cockatoo (the Southern or Tasmania ssp xanthanotus), Green Rosella, Tasmanian Scrubwren, Golden Whistler, Forest Raven and honeyeater such as Yellow-throated, Large-billed and Black-headed. Laughing Kookaburra feed around the picnic area; like the Superb Lyrebird, they are amongst a number of the Australian mainland native birds introduced to Tasmania. Next stop was Bicheno. It’s a very pleasant coastal town located on the east coast of Tasmania, 280 km from where we were staying in Burnie. The main reason we chose to stay in Bicheno was to hang around the beach and go swimmer. It was the summer holidays after all. That said, in terms of birding the areas great, with habitats such as great beaches, impressive on- and off-shore rocks, adjacent heathland and surrounded by dry eucalypt forests. 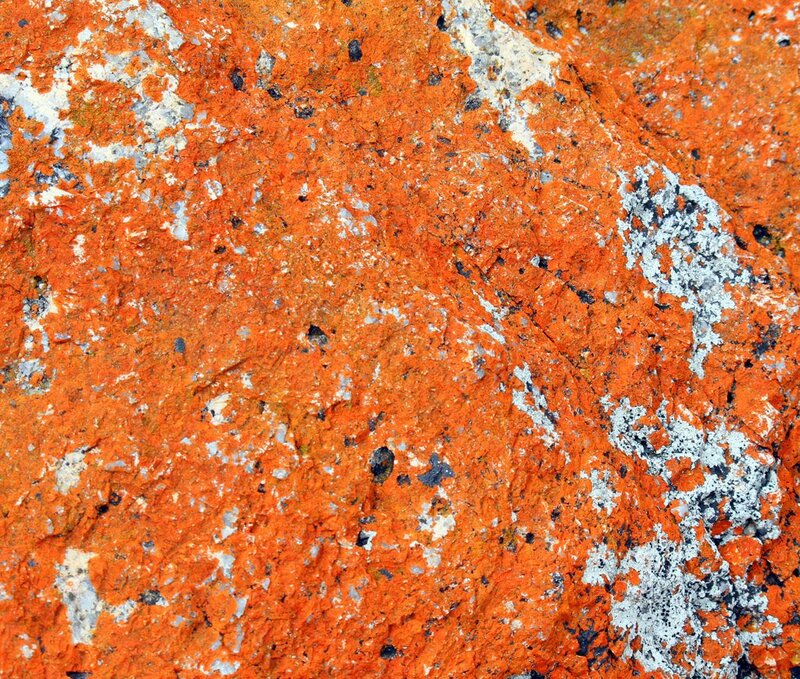 Orange lichen on rock, Bicheno. The 3 km Waub’s Bay foreshore walk (~3 km one way) treks you from town to Redbill Beach and the picturesque nature reserve called Diamond Island CR. Dominated by Seaberry Saltbush ( Rhagodia candolleana), the island protects a colony of Little Penguin. Along the foreshore walk itself there were Little Penguin, Musk Lorikeet, Green Rosella, Yellow-tailed Black-Cockatoo, Australian Magpie (ssp hypoleuca), honeyeaters such as Black-headed, Yellow-throated and New Holland, very tame Grey Fantail (ssp albiscapa), Superb Fairy-wren (larger deep-blue Tasmanian ssp cyaneus), Tasmanian Scrubwren, Brown and, perhaps surprising, Tasmanian Thornbill (seen in the shadier scrub about 50 m south of the Gordon St carpark), a species I normally associated with forests. A pair of Hooded Plover feed along the shoreline of the Redbill Beach, as well as Australian Pied and Sooty Oystercatcher (known locally as Redbill’s). Seabirds included Kelp and Pacific Gull, Caspian and Crested Tern, Australasian Gannet, Black-faced Cormorant, a continual distant swath of Short-tailed Shearwater, and the odd Shy Albatross. Occasionally I’d see a pair of White-bellied Sea-Eagle, one of less than 200 pairs breeding in Tasmania. Sitting on the balcony of the house we’d rented (north part of Bicheno near Redbill Beach and Diamond Is) each evening Little Penguin called all around us. For some reason their call reminded me of Bush Stone-curlew calling at night on Magnetic Is. One of the big birding surprises in Bicheno was stumbling across the Governor Is Marine Nature Reserve. The reserve consists of two small islands immediately east of the town. I’d not heard about this reserve, and I literally stumbled across it while buying fish. To my surprise Governor Is supports one of Tasmania’s largest breeding colony of Crested Tern, ~2000 pairs, as well as nesting Silver Gull, Little Penguin, Sooty Oystercatcher and occasional White-fronted Tern. The Nuggets, Freycinet National Park. In Bicheno, it is also worth doing the walk up to Whalers Lookout. It provides good views across to Governor Island, and was a good spot to see Tasmanian Rock Orchid (Dockrillia striolata). Douglas-Apsley National Park is a good example of the dry eucalypt woodlands found across much of the eastern Tasmania. With an interesting diversity of eucalypts (the park contains over half of the Tasmania’s species), the main types included Blue Gum (Eucalyptus globulas), White (Manna) Gum (E. viminalis) and the endemic Black Peppermint (E. amygdalina). The other dominant trees include Yellow Dogwood (Pomaderris elliptica), Silver Banksia (Banksia marginate), Blackwood (Acacia melanoxylon), Black Wattle (A. mearnsii) and Black Sheoak (Allocasuarina littoralis). These all added up to a very pleasant national park. I was both keen to see what woodland birds occurred in the park, but also keen do some spotlighting for birds and mammals. Access to Douglas-Apsley is via Rosedale Rd, 5 km north of Bicheno. On the way into the park I had my first encounter with a pair of Wedge-tailed Eagle, with two adults cirling over farmland. 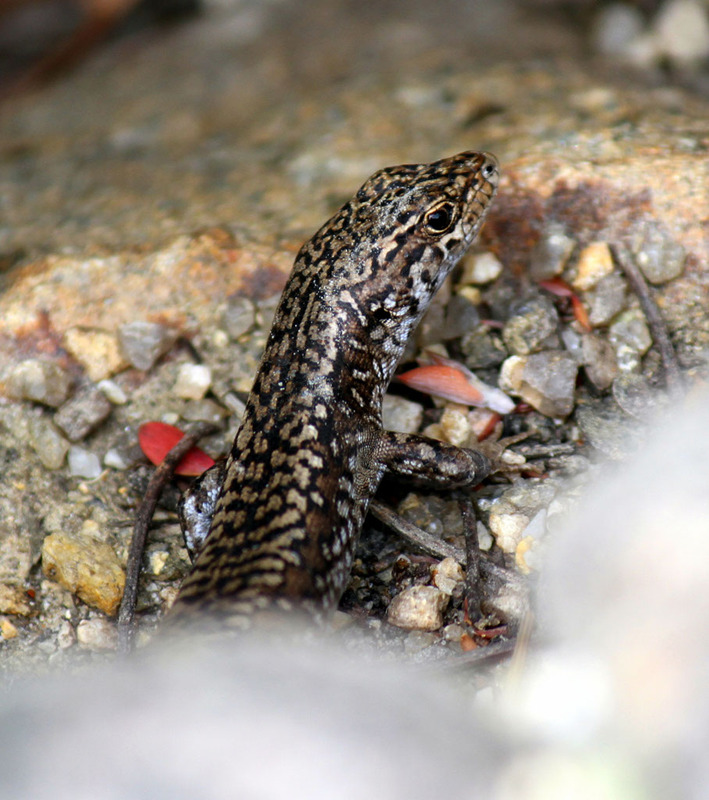 This is the endangered Tasmanian ssp fleayi, with an estimated population of just 80 pairs. Along the road there was a small group of Wild Turkey, not necessarily wild free-flying birds but they certainly were in the wild, as well as Flame Robin and Eastern Rosella (ssp diemenensis), with its rich red-head and larger white cheeks. Once in the park, I was surprised to find that Yellow Wattlebird was the most common bird. I then noticed that Yellow Wattlebird was Douglas-Apsley’s national park emblem. It made perfect sense. As far as calls go the Yellow Wattlebird must have one of the silliest. A sort of raucous silly kukuk, spat out while the bird jerks its head back and forward. Doing the pleasant Lookout Track (~1.2 km return) to the Apsley Waterhole I saw Musk Lorikeet, Green Rosella, Common Bronzewing, Yellow-throated and Crescent Honeyeater, Noisy Miner, Forest Raven, Grey Butcherbird (the Tasmanian Butcherbird ssp cinereus), Pallid Cuckoo, Black-faced Cuckoo-shrike, Scarlet Robin and Grey Shrike-thrush (ssp strigata). One thing noticeable about the Tasmanian Grey Shrike-thrush is its noticeably larger bill; as usual, it was also nice to hear the local vocal dialect, an ascending joe-witt-ee. Moulting Lagoon, with the Freycinet Peninsular in the background. Several Beautiful Firetail feed near a small dam along a small 4W4 track that leads west from the car park – it borders the western fence line. Also here were several ‘Bennett’s Wallaby’, the shaggier Tasmanian subspecies banksianus of the Red-necked Wallaby. There were also some large canine-type tracks here, with fresh dropping. So, I decided this was a good spot to return that evening and go spotlighting. That night, with John Shute, it didn’t take long for us to find several enormous rufous-brown coloured Common Brushtail Possum. They were easily twice the size of any possums I’d seen previously. Spotlighting at the small dam where I’d seen the Beautiful Firetail earlier, a large stocky and very black animal moved quickly up the track. I pointed it out to John, and we tried to follow it, hoping to get a better views. In loping gaits, it ran up the track and in to the bush. It was a Tasmania Devil, my first in the wild! Along the road back to Bicheno a Morepork flew into a roadside tree. It was nice to finally get a view of this bird. Although I’d heard them many times previously, I’d never actually seem one in the flesh. This species of owl was formally classified as a Southern Boobook, and known locally as the Tasmanian Spotted Boobook ssp leucopsis. According to the IOC it’s recently been split from the mainland Boobook and is now considered a subspecies of the New Zealand Morepork (Ninox novaeseelandiae leucopsis ). Some birders wonder how can this split occur? 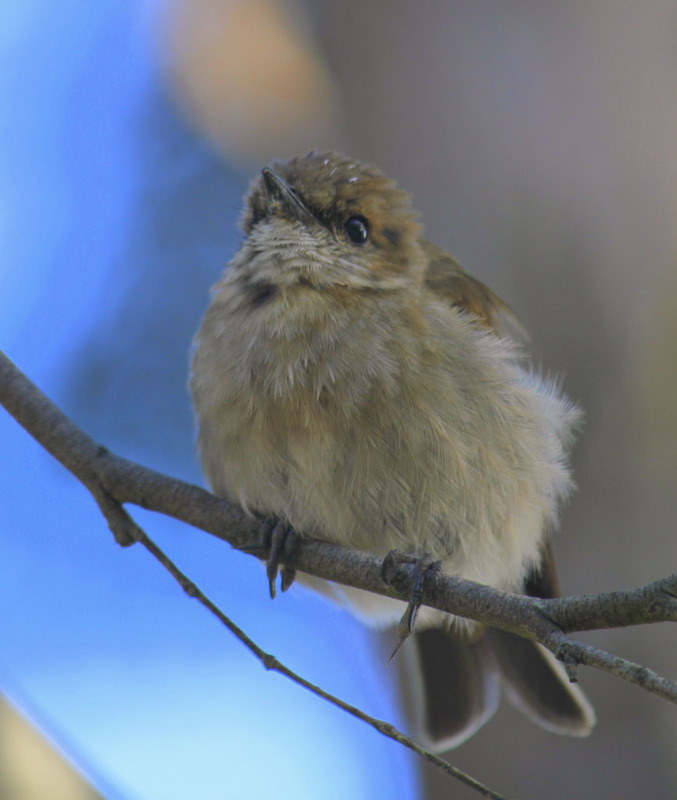 How can a subspecies of the New Zealand bird be found in Tasmania? The logic is that it’s remnant population. Historically Ninox novaeseelandiae was once found right across Australia. However, since the rise of Bass Strait, another bird in the same Taxa, Ninox boobook, moved across mainland Australia and now dominate the landscape. The result is that Ninox novaeseelandiae leucopsis became isolated in Tasmania. 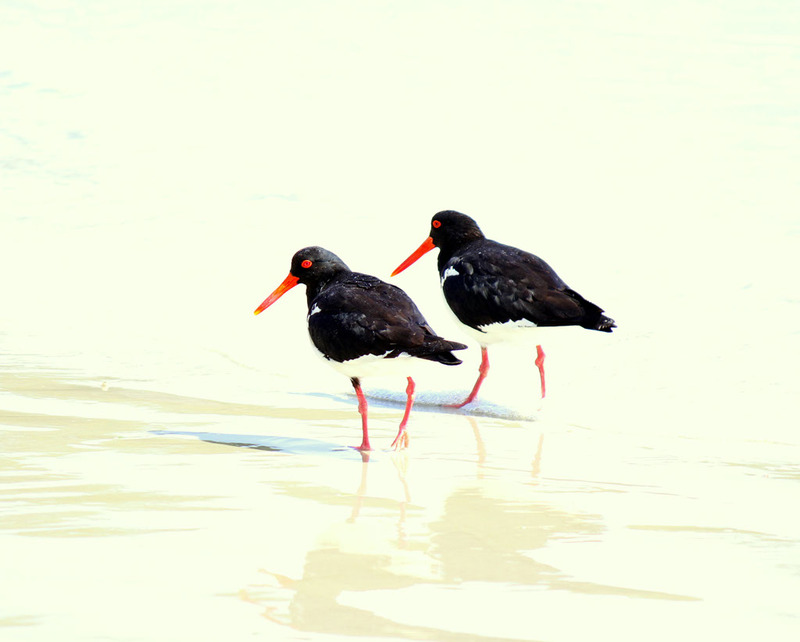 No self-respecting beach in Tasmania is complete without a pair of Australian Pied Oystercatchers. Seeing this bird meant that it was now an official ‘life tick’, and I could add it to my Australian list. That’s assuming I adopt the IOC checklist of course. May as well, it does contain more species than other comparable lists. Apart from being good for twitching, having more species on the list isn’t such as bad idea. For instance, you just need to think of the conservation value of splitting Ground Parrot – Western and Eastern. From a purely political context, rather than taxonomic, this means more dedicated conservation funds for the Western Ground Parrot because of its higher classification status. From Bicheno we made day trips to a few areas within a cooee. From Bicheno, we travelled north up the Tasman Hwy. Stopped at St Helens for Tasmania’s self-proclaimed “world’s best chowder” at the Paddle Wheeler, a fish and chippery on a boat in the harbour. 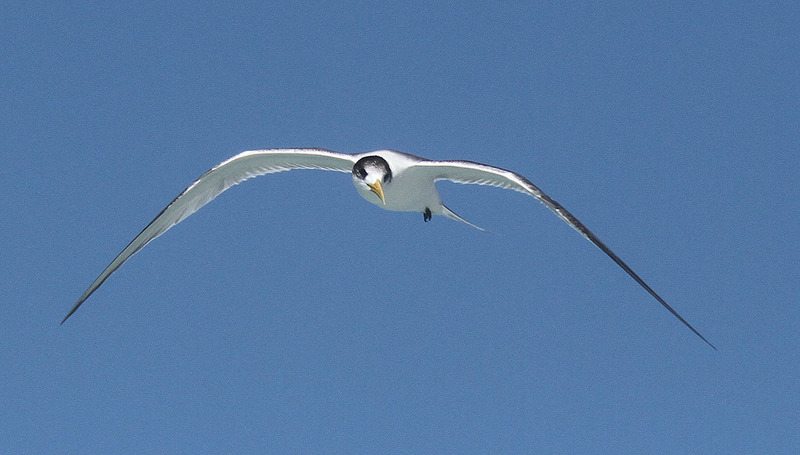 While sipping my soup (it was pretty good) a Fairy Tern flew past. Not a bad way to see my first Tasmanian Fairy Tern. 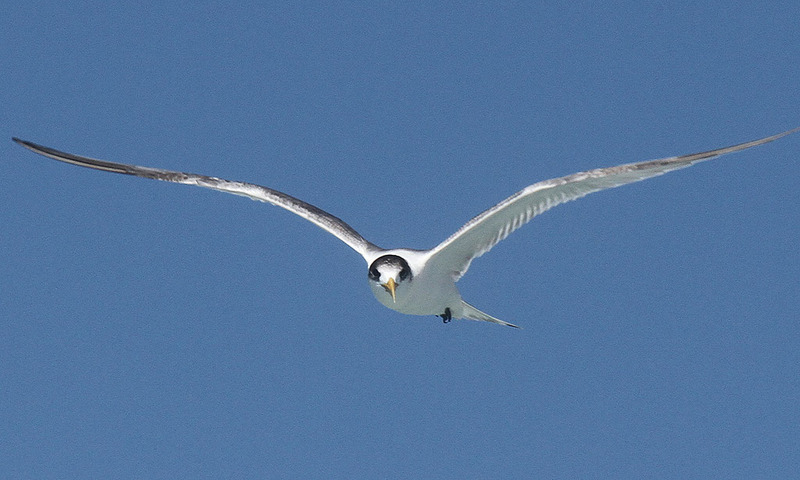 Note that I later saw another Fairy Tern in Scamander harbour. Binalong Bay was a short drive north of St Helens . The beach here was simply spectacular. By my reckoning, one of the best swimming beaching in Australia, perfect for kids. Along the beach I found to two separate groups of Hooded Plover, two and six. According to the local park ranger, Liz Znidersic (who incidentally is currently researching Lewin’s Rail in Tasman Is), there’d been two successful breeding attempts by Hooded Plover on Binalong Beach this season. On the way back from Binalong Bay we made brief (20 km) detour to the Trout Creek picnic area in Scamander Forest Reserve. Although it was fairly uneventful in the early evening, for reference this is a good site for Tasmanian Masked Owl. Tree trunk, Franklin-Gordon Wild Rivers National Park. 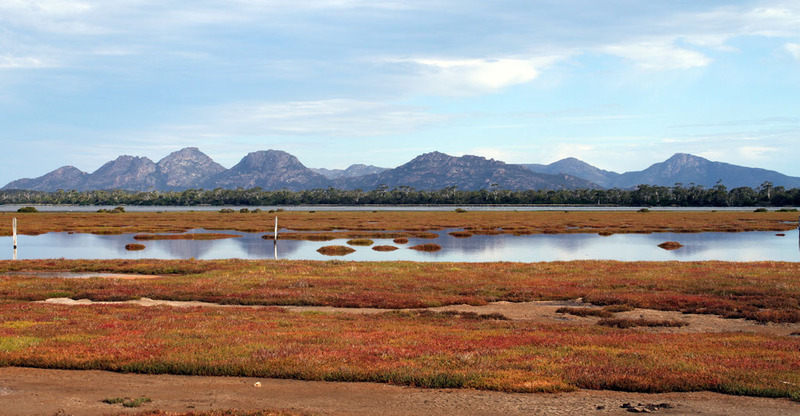 Moulting Lagoon is a large wetland and Ramsar site 18 km south of Bicheno. It’s a significant breeding and moulting site for Black Swan (as many as 10,000 birds have been recorded), and there were plenty about. Other birds here included Chestnut Teal, Australian Shelduck, Musk Duck, Australian Pelican, Great Egret and White-faced Heron. There were also a few of the larger waders, Eastern Curlew and Bar-tailed Godwit. FYI I accessed the lagoon via Flacks Rd – it’s heads south off Cole Bay Rd (the road to Freycinet) about 16.5 km from the Tasman Hwy. The best spot for birding is at the very end of the road. There were a few birds of prey around the wetland, a White-bellied Sea-Eagle, several Swamp Harrier, easily the most common raptor on the island, and a Brown Falcon. On your way to Moulting Lagoon, a few of kilometres down Flacks Rd, you pass an enclosed sanctuary for Tasmanian Devil. An extremely impressive structure, it was great to see that my sponsorship of John Weigel’s Australian Big Year was going in the right direction. My sponsorship went towards fence building at Devil reserves. Thanks John. 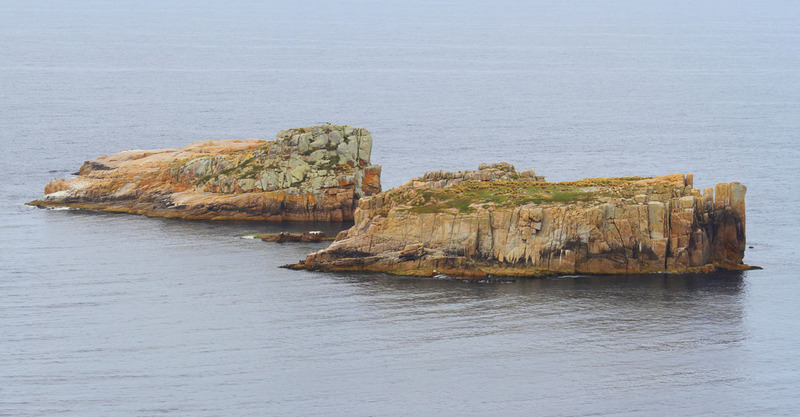 The view from Cape Tourville Lighthouse is spectacular, providing a perfect vantage point for seabird-watching, and you look down upon The Nuggets, an important breeding and resting sites for seabirds. Groups of Australian Fur Seal were hauled out and resting. Out to sea there were seabirds such as Crested and Caspian Term, Kelp and Pacific Gull, Australasian Gannet, Black-faced and Great Cormorant, Sooty Oystercatcher, Short-tailed Shearwater and few Shy Albatross (white-capped ssp cauta) glided close onshore. Along the walk Tree Martin hawked for insects, and dozens of skinks scurried under the walk way, including White’s (Egernia whitii), Occellated (Niveoscincus ocellatus) and Metallic (N. metallicus) Skink. Not a bad collection: I wonder why so many, and such a range of species, are found in one spot? The black-morphed Tasmanian Tiger Snake (Notechis ater humphreysi), sometimes known as the ‘Black Tiger’, is fairly common on the Freycinet Peninsula (and across much of Tasmania). Looking at my old copy of Snake of Australia by Graeme Gow, he notes that this supspecies is cannabalistic. 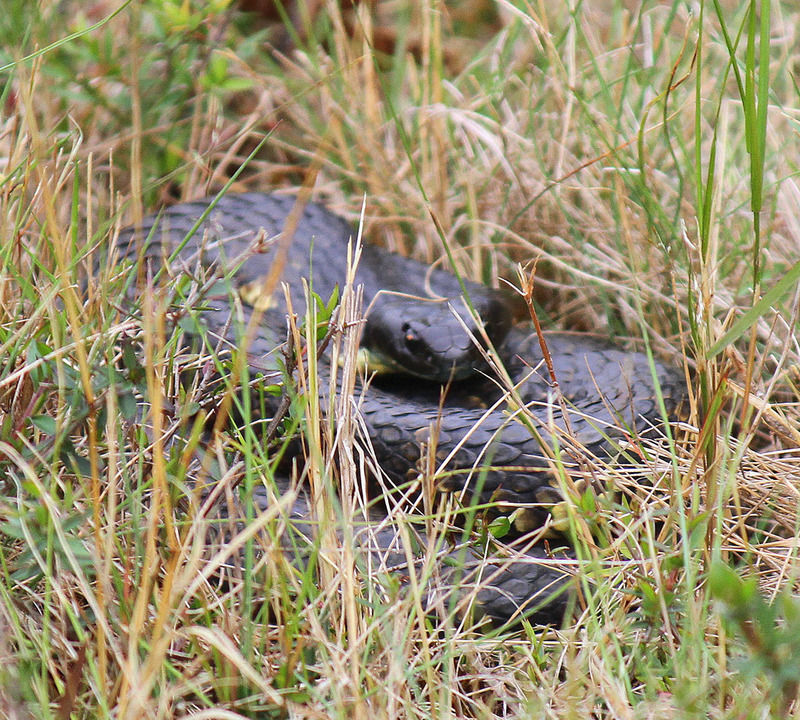 It’s also the snake that feeds on the Muttonbird (Short-tailed Shearwater) colonies in Bass Strait. Many are blind after having their eyes pecked by defending Muttonbird. Interestingly this doesn’t seem to affect the mortality rate with many, despite being blind, living a full and prosperous life. Bennett’s Wallaby is also common of the Freycinet Peninsula, and are tame around the Wineglass Bay car park. From there I did a walk through some heathland just west of the Wineglass Bay car park (accessed via a the road that continues west from near the carpark entrance), along which there were Green Rosella, Brush Bronzewing, Scarlet Robin, Golden Whistler, Tasmanian Scrubwren, both Brown and Tasmanian Thornbill, Shining Bronze-Cuckoo, Eastern Spinebill, Little and Yellow Wattlebird and New Holland, Black-headed, Yellow-throated and Crescent Honeyeater. On my first day in Tasmania I was surprised to see Large Earth Bumblebee (Bombus terrestris), as stunning a looking bee as you’ll ever see. Over the rest of the trip I was amazed how common they were. I knew they’d become established in Tasmania – they were 1st reported in 1992) – but on previous trips I’d never noticed them. Now they were literally everywhere, and feeding on both exotic and native flowers. This could become a real problem. Introduced bees, no matter what species they are, can change the nature of plant-pollination. They displace native flower-feeding, and they can reduce the pollination of native plants and increase the pollinating and proliferation of exotic plants. As a child, I remember watching Harry Butler’s In the Wild. In one particular episode Harry makes the comment that “The Rabbit is not Australia’s most destructive introduced animal, the European Honey Bee is!”. According to some 19th century theorists, the laws of aerodynamics indicate that Bumblebee is incapable of flight. Their wings are just too small to support flight. Some anti-evolutionary theorists argued that because the flight of Bumblebee was scientifically impossible, it therefore proved in the existence of God. Of course such an idea is fanciful, as fanciful as Disney’s Fantasia. Given the fact that the Bumblebee can fly, arriving in mainland Australia may be just a matter of time. From Bicheno we headed south through down town Hobart to Bruny Island. 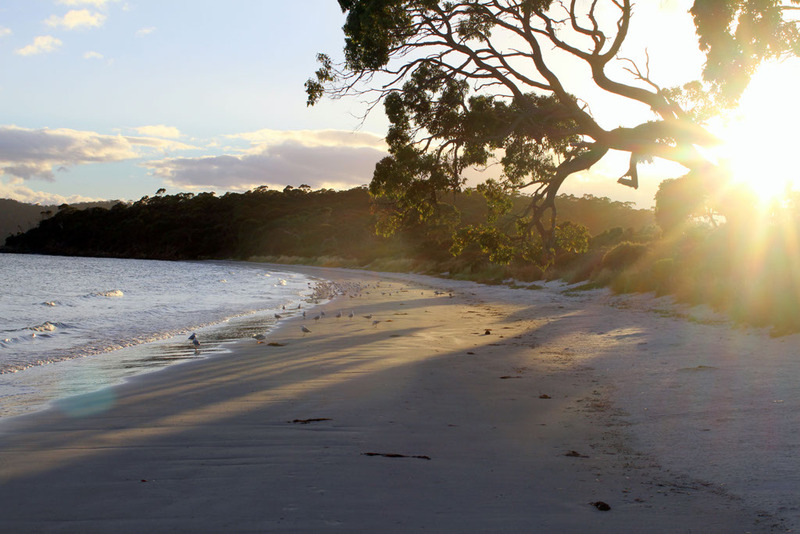 We camped at the excellent Jetty Beach campground in South Bruny Island National Park. The campground and the beach here are absolutely superb! It was a little busy being the Christmas holidays, but I image that for most of the year you could pick and choose your site. Located at the very north end of Bruny Island, the Jetty Beach Campground was one of those places where you didn’t need to move about to be surrounded by birds. In fact. it was the most “birdy” place I visited in Tasmania – it’s surprising how little has been written about Jetty Beach by birders. Dusky Robin was the most common bird around the campground, with several nests immediately adjacent to our campsite. The adult birds continually searched for food all around us, sometimes sitting, typically sideways, on the tree beside you. On Bruny Island I met up with local conservation Nick Mooney, and by his reckoning Jetty Beach is the best spot in Tasmania for seeing Dusky Robin up close. After staying there a few days, I’m in complete agreeance. Olive Whistler was another campground bird, with a male calling each morning immediately beside our tent, as did Bassian Thrush, scurrying around the Austral Bracken (Pteridium esculentum) thickets. The thrush was perhaps feeding on Forest Scorpion (Cercophonius squama), the only species of scorpion that occurs in Tasmania. Quite common around the campsite, I found several under the tent when we packed up. Fortunately it’s fairly harmless. Other birds seen around the campground included Green Rosella, Satin Flycatcher, Rose and Scarlet Robin, Golden Whistler, Grey Shrike-thrush, Yellow-throated, Strong-billed, Black-headed, New Holland and Crescent Honeyeater and Striated Pardalote, and two Tree Martin spent most of their day hawking for insects around our site. There was even a young family of very green Green Finch, with the two parents were being continually hassled by four youngsters. Jetty Beach is pristine and idyllic . And no self-respecting idyllic beach in Tasmania would be seen without a pair of Australian Pied Oystercatcher. There was also Chestnut Teal, large flocks of Silver Gull, Pacific Gull, Crested Tern and White-faced Heron, and a small pod of Bottlenose Dolphin swam offshore. Along the beach the foot prints of what I thought were Spot-tailed Quoll (see footprint image at the end of this report) and Tasmanian Devil, although apparently both don’t occur on Bruny Island. I wonder what they were? Eastern Quoll? Along the access road into Jetty Beach you pass through some excellent areas of heath. For birders a good heathland is paradise – so of course that’s where I spent my mornings walking. 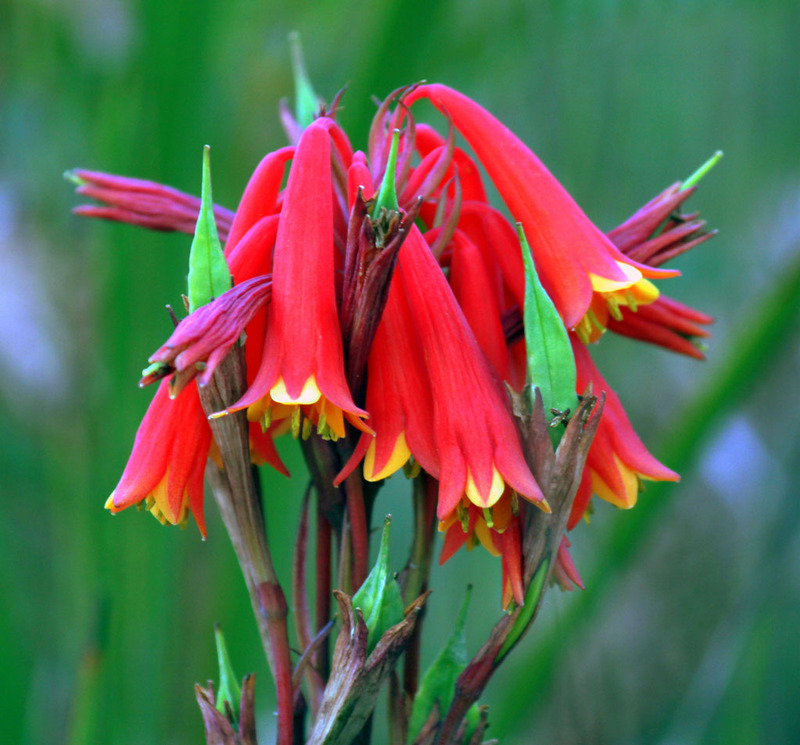 The heath was scattered with flowering Tasmanian Christmas Bell (Blandfordia punicea). What a spectacular flower. I was actually surprised to see it here. Why wasn’t it better know, in a similar way to the Tasmanian Waratah (Telopea truncata), a plant I’d previously seen flowering on the road up to Mt Wellington. The last time I’d seen Christmas Bell was at Crowdy Bay National Park (central NSW) – this was the Large Christmas Bell (Blandfordia grandiflora), and equally spectacular. It seems a very long hop between there to here, and why aren’t Blandfordia sp. found in Victoria? Somewhere like Croajingolong? Was there some historical geological link between Tasmanian and central NSW? 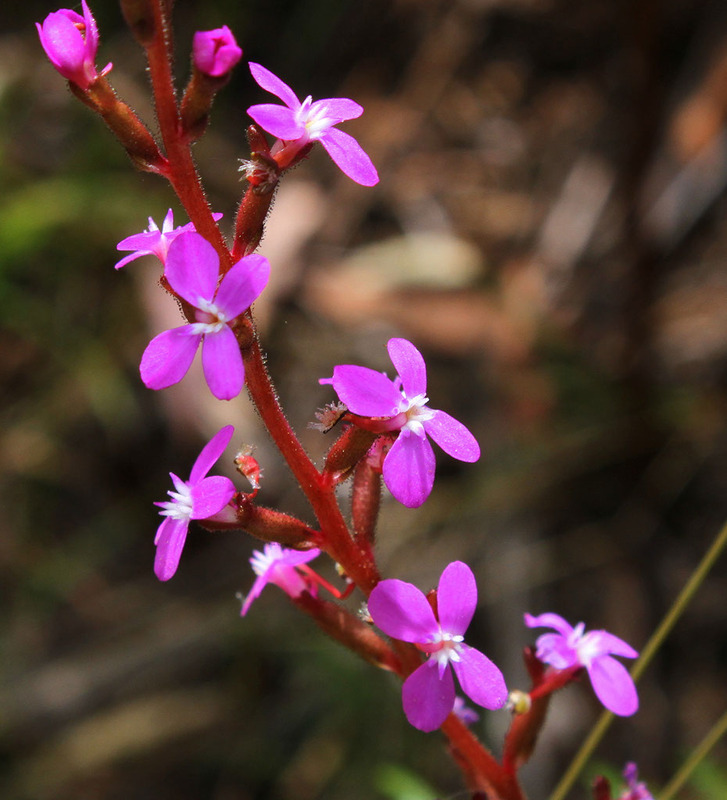 Another common flowering plant that provided striking colour across the heath was the Narrow-Leaf Trigger Plant ( Stylidium lineare). A really interesting plant, with its butterfly shaped bright pink flowers, it has a pollination mechanism that involves a sensitive “trigger”, unique to this family. It also possesses glandular trichomes that are capable of digesting nutrients from any prey captured in its sticky mucilage, suggesting that it’s either carnivorous or at the very least protocarnivorous. What a wonderful flower. Beautiful Firetail was a common bird in the heath, as were Yellow-tailed Black-Cockatoo, Olive Whistler (ssp apatetes), Scarlet Robin, Satin Flycatcher and Shining Bronze-Cuckoo and Fan-tailed Cuckoo, while Crescent Honeyeater was the most common honeyeater. A nice surprise was a couple of immature White-bellied Sea-eagle circling over the heath towards Jetty Beach. 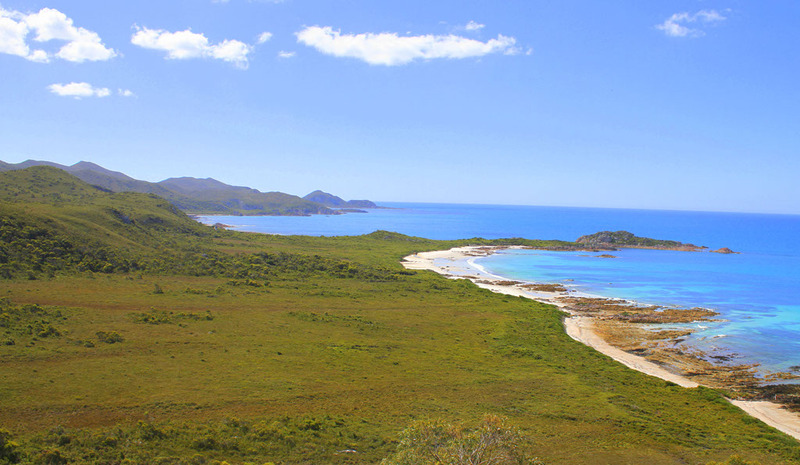 The lengthy Labillardiere Peninsula circuit walk (it’s about 15 km) starts at the Jetty beach campground, and does a loop of the peninsula. Beautiful Firetail, Tawny-crowned Honeyeater and Olive Whistler occur along the beginning of this walk and – although I didn’t see any – so do Eastern Ground Parrot. Half way along the walk you come to Partridge Island, a small island of the coast of Bruny that protects a large colony of Forty-spotted Pardalote. Like the Cape Tourville Lighthouse, the views from the Cape Bruny Lighthouse are spectacular. Around the lighthouse the most interesting species were Flame Robin, Shining Bronze-Cuckoo and a pair of Blue-winged Parrot zitted overhead. Out to sea, there were rafts of Short-tailed Shearwater and there several Shy (White-capped ssp cauta) Albatross. The birding around this attractive coastal township was quite good, with birds such as Tasmanian Native Hen, Green Rosella, Yellow-throated, Strong-billed Honeyeater, Yellow Wattlebird, Black Currawong and Dusky Woodswallow all fairly common. 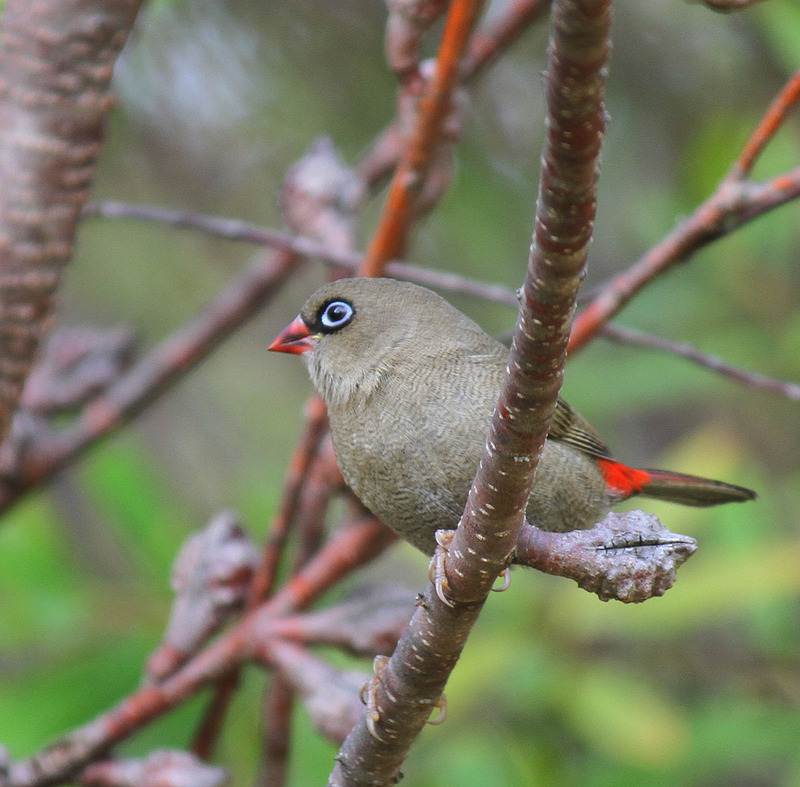 Beautiful Firetail, Douglas Apsley National Park. Near Adventure Bay I was pleasantly surprised to find some cool temperate rainforest, particularly along Coolangata Rd near the top of Mount Mangana, and the short and very pretty Mavista Nature Walk. 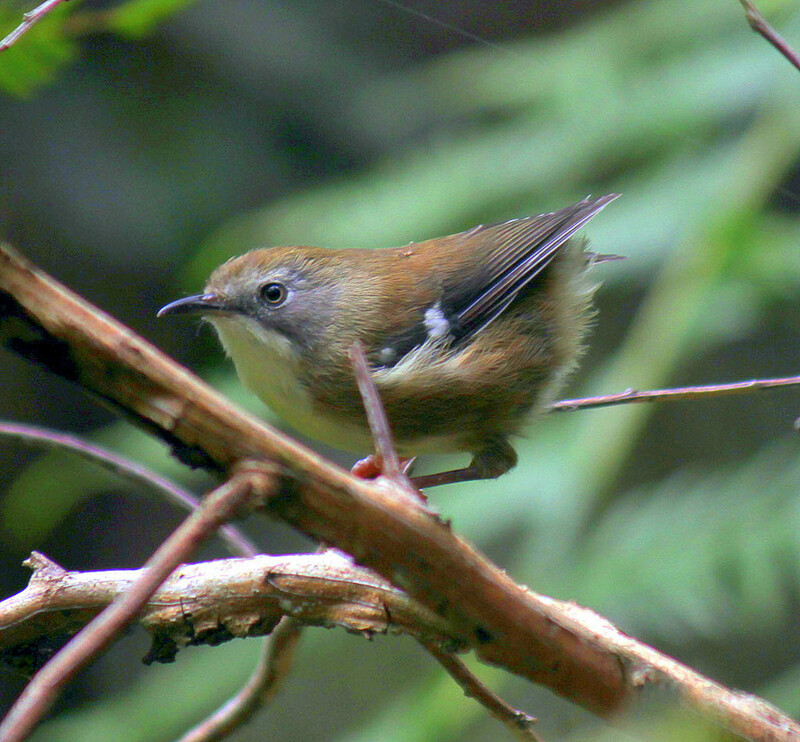 The rainforest had the classic feel of an ancient Gondwana forest, and contained birds such as Pink and Dusky Robin, Robin, Tasmanian Thornbill and Scrubtit, with a pair in a gully on the Mavista Nature Walk. While eating day old cheese and freshly cooked bread at the Bruny Island Cheese Company a few Swift Parrot flew over, with bursts of high pitched chattering pee-pit, pee-pit. Note: during spring and summer the best spots to look for Swift Parrot on Bruny Is are near the Robert Point Ferry Terminal, Church Bay (Killora), the Adventure Bay foreshore and the Grassy Point Tk, east of Adventure Bay. Reports tend to be associated with flowering Blue Gum (Eucalyptus globulus) and Black Gum (E. ovata). Connecting the two halves of the Island, ‘The Neck’ is an interesting place that’s well worth a stop. It’s an breeding site for Little Penguin and Short-tailed Shearwater (~240,000 pairs breed on Bruny!). The best viewing area is near the steps up to the lookout at the Hummock, where there’s a boardwalk and viewing platform. FYI here’s a few notes on Forty-spotted on Bruny Is. 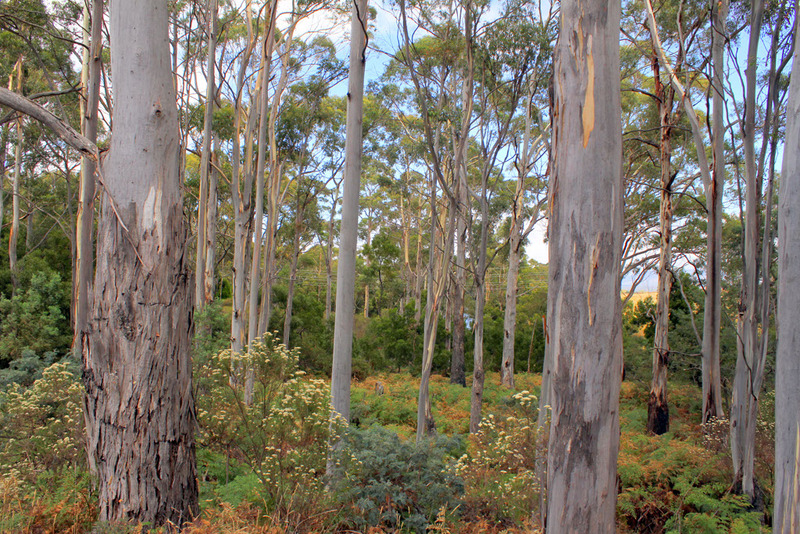 Intrinsically linked to White Gum (Eucalyptus viminalis), the best spot to search for Forty-spotted on Bruny Is are on North Bruny Is at the north end of Bruny Island Main Rd, just south of Dennes Point – search around the base of Waterview Hill. They also occur in the roadside woodlands along Missionary Rd, particularly near McCraken Creek. On South Bruny Island, they are also found on INALA, a privately owned eco-friendly property with excellent accommodation. Notably all of Tasmania’s endemics plus Masked Owl have been recorded on INALA, possibly the only site in Tasmania where this occurs. Its owned by Dr Tonia Cochran, who conducts excellent wildlife tours. The Forty-spotted Habitat Network also have some excellent map on their website that deal with Forty-spotted distribution. The Peter Murrell Reserves are the most reliable location near Hobart to see the endangered Forty-spotted Pardalote. Discovered here by the Coffee Creek Landcare Group in 1994, the best spot for seeing them is in the northern section of the reserve, entering via Huntingfield Ave. To get there, turn left off the Channel Hwy into Huntingfield Ave, 2 km south of Kingston (passing the Antarctic Division), travel 700 m and then turn left again down a dirt track – it’s located immediately south of the Vodafone Factory. Here there’s a Peter Murrell Reserves sign at the entrance. Follow the track down to the carpark near the Penrhyn Pond. There’s a good map of reserves at the parks website. Upon arriving, I walked along the western edge of the Penrhyn Pond, past the birdhide, until I reached the Coffee Creek Fire Trail. Here pardalotes of all types were calling from the White Gum at the intersection of the Coffee Creek Fire Trail and Scarborough Fire Trial, with a delightful cacophony of the bird calls: the two-toned se-saw of Spotted, the higher-pitched wit-wit-wit of Striated, and the where-where-where of the Forty-spotted. 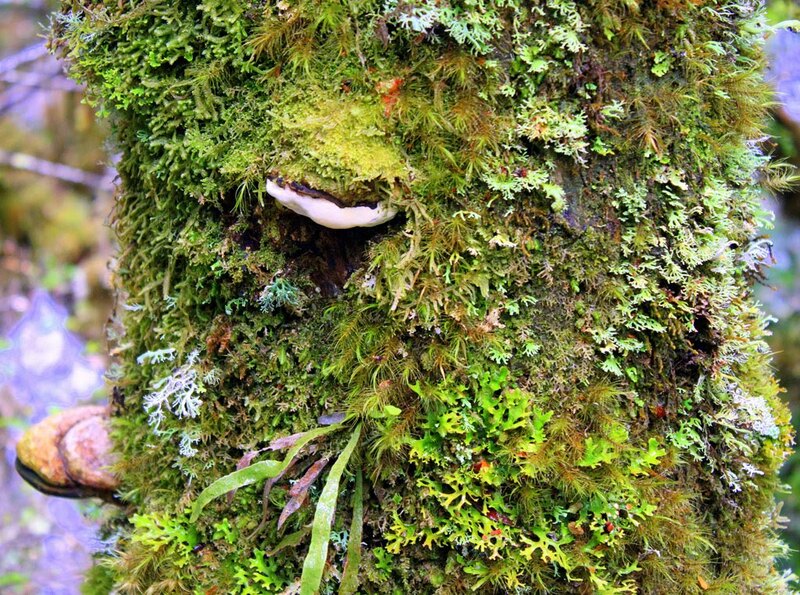 After a bit of searching I found several Forty-spotted foraging in the upper foliage. Other birds here include Hoary-headed Grebe, Swamp Harrier, Brown Falcon, Tasmanian Native-hen, Yellow-tailed Black-Cockatoo, Galah, which is interestingly only a recent arrival to Tasmania (either introduced or self-introduced), Eastern Rosella, Fan-tailed Cuckoo, Grey Butcherbird (ssp cinereus), Brown and Yellow-rumped Thornbill, Yellow Wattlebird, Yellow-throated Honeyeater, Black-headed, Crescent and New Holland Honeyeater, Eastern Spinebill, Superb Fairy-wren, Dusky Woodswallow and the sooty black Tasmanian Grey Currawong, known locally as the ‘Clinking Currawong’ (ssp arguta). The Snug Falls Walk is a nice walk to combine with a trip to Peter Murrell Reserves, located ~10 km to the north. Relatively close to each other, visiting both is a good way combine a visit to dry eucalyptus woodlands with wet temperate forests. 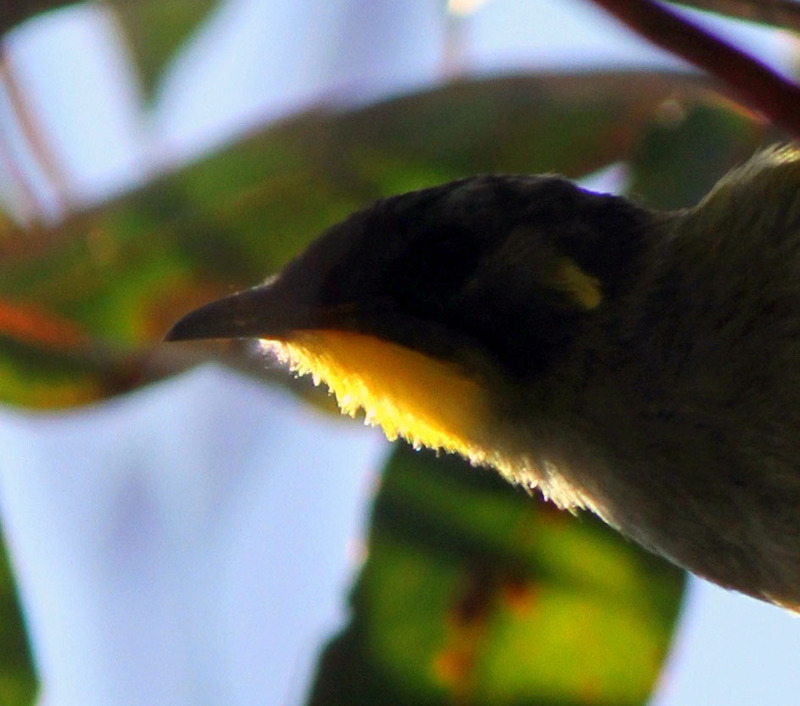 Snug Falls is an great place to see the endemic and uncommon Scrubtit. To get there from Hobart, take the Channel Hwy 24 km south to Snug (a town that officially has the best name in Tasmania). From there turn down Snug Tiers Rd, and after 1 km turn left onto Snug Falls Rd – following this to the sign-posted car park. The walk down to Snug Falls descends for about 1 km, down through bushland to a cool, fern-lined rainforest gully at Snug Falls. Heathland, behind Jetty Beach on Bruny Island. I found the best place for seeing Scrubtit to be the very bottom of the walk, near the waterfall. Here, with a bit of searching, I also found some of the other wet forest specialists, such as Pink Robin, Olive Whistler, Bassian Thrush and Tasmanian Thornbill. The Scrubtit were on the right side of the track immediately before you reached the falls. Black Currawong was also a common bird around Snug Falls, its loud, distinctive but comical call (best described as a kar-week, week-kar) reverberated around the bottom of the valley. In the woodlands on the way down to the falls I also saw Green Rosella, Crescent, Strong-billed and Yellow-throated honeyeater, Scarlet Robin, Grey Shrike-thrush, Brown Thornbill and Grey Fantail. PS. Snug Butchery sells cheap Lobster (35$ each) and home-made Scollop Pies (a Tassie specialty). Not a bad butcher. In fact the butcher in Bicheno was also excellent. Must be a Tasmanian thing. 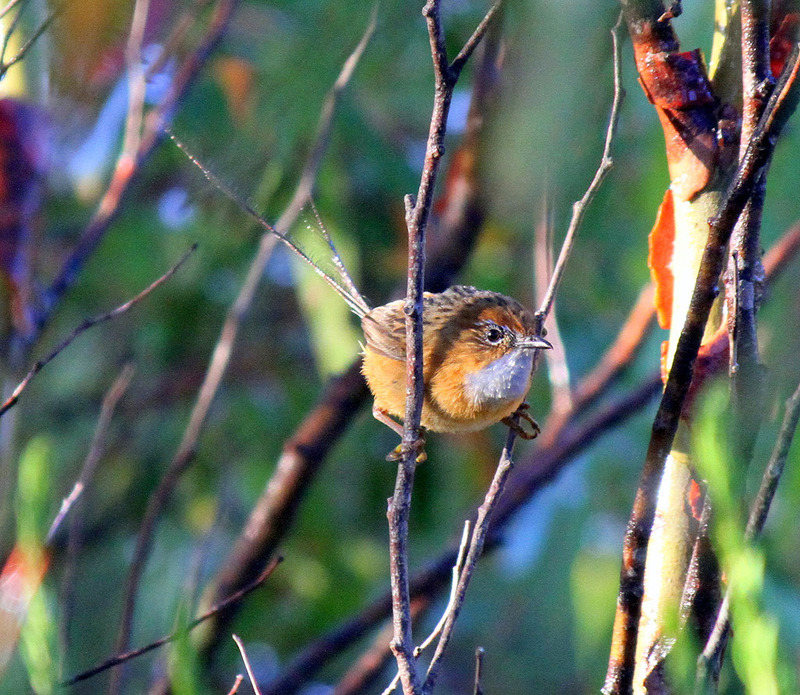 Male Southern Emu-wren, in heathland near Strahan. From Hobart, we drove across central Tasmanian via the Lyell Hwy. Spectacular scenery and a spectacular road. We stayed overnight in the highlands of Tasmania, staying in backpacker style huts (called Bushwalkers Rooms) at the Derwent Bridge Wilderness Hotel. Cheap and good value (30$ per person) – not to everyone’s liking, but perfect for birdwatching-types. Black Currawong and Yellow Wattlebird were common around the huts. Spotlighting at night produced Tasmanian Pademelon and an enormous Wombat. The call of the Morepork here was distinctively different from the other Morepork I’d heard in Tasmania. In terms of Ninox distribution, what was going on here? Lake St Clair was a place to avoid. I’ve never seen so many middle-classed, white, conservation-minded, Katmandu-shopping types in my life – a bit like myself really. All had enormous rucksacks, no one was smiling, and looked as though they’d just tried to climb Everest but failed. It was like looking iin a mirror and seeing a thousand faces looking back – the only thing missing was a pair of binoculars around their necks. Seeing them sent shivers up my spine, and I couldn’t wait to get out of there. Between Derwent Bridge and Queenstown (now that’s some sort of town), we stopped to walk the Franklin River Nature Trail. 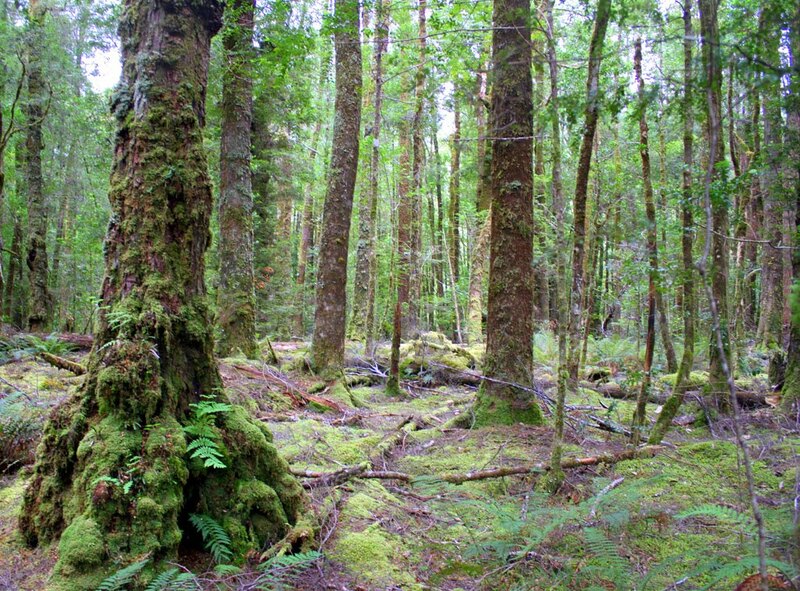 Regarded as one of Tasmania’s best short walks in Tasmania, it takes you along the banks of the Franklin River and winds through cool temperate rainforest. You really do feel like you’re stepping back in time. 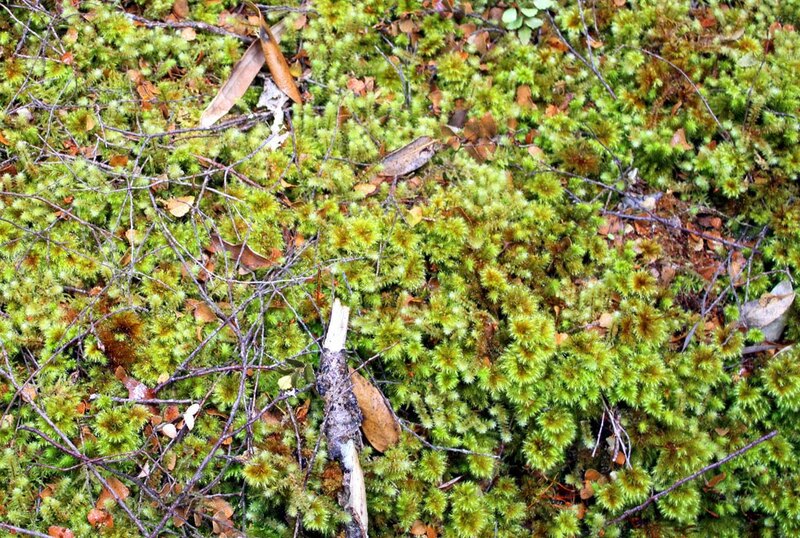 The rainforest here is simply magical, and the ground is completely covered in think moss! I’ve never seen anything like it. 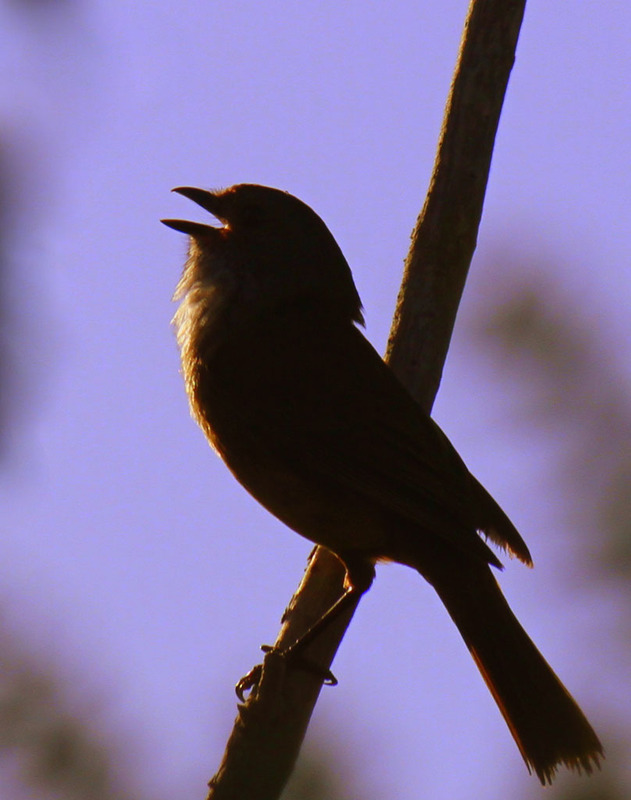 That being said, it wasn’t particularly birdy – although a spring dawn chorus might be interesting. Bird here include Pink Robin, Black Currawong, Forest Raven and Crescent Honeyeater. Heathland along Ocean Beach Rd, near Strahan. Strahan is a delightful, somewhat touristy town located on Tasmania’s west coast. We stayed at the Strahan Backpackers YHA, which proved excellent, with a very pleasant small camping area nestled beside a stream. White Gum in the camping area attracted honeyeaters such as Strong-billed, Black-headed and Yellow-throated, while a Collared Sparrowhawk made a regular appearance. It had a regular flight path up and down the stream. At dawn and dusk a lone Laughing Kookaburra gave a solitary laugh, with no replies. How often do you hear that? One laugh made by a solitary Kookaburra? Obviously a bit a jackass. At night an Australian Owlet-nightjar (ssp tasmanicus) called in the campground – the only place in Tasmania where I heard this species. 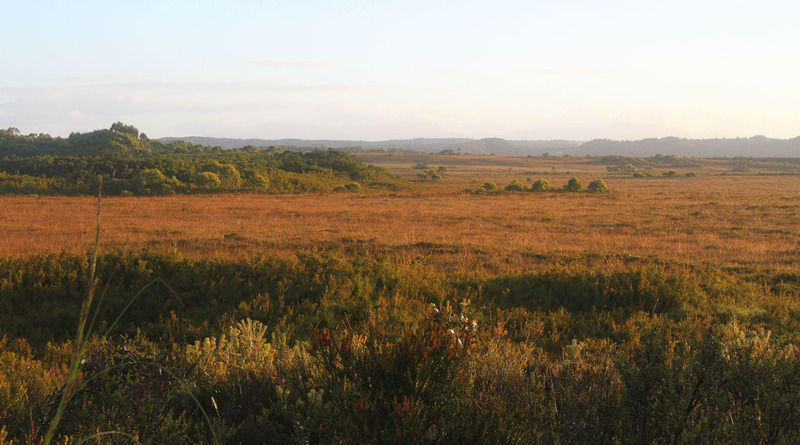 In terms of birding Strahan is best known for its superb heath and Button-grass plains. I found that the best area for birding was Ocean Beach Rd, just past the airport. 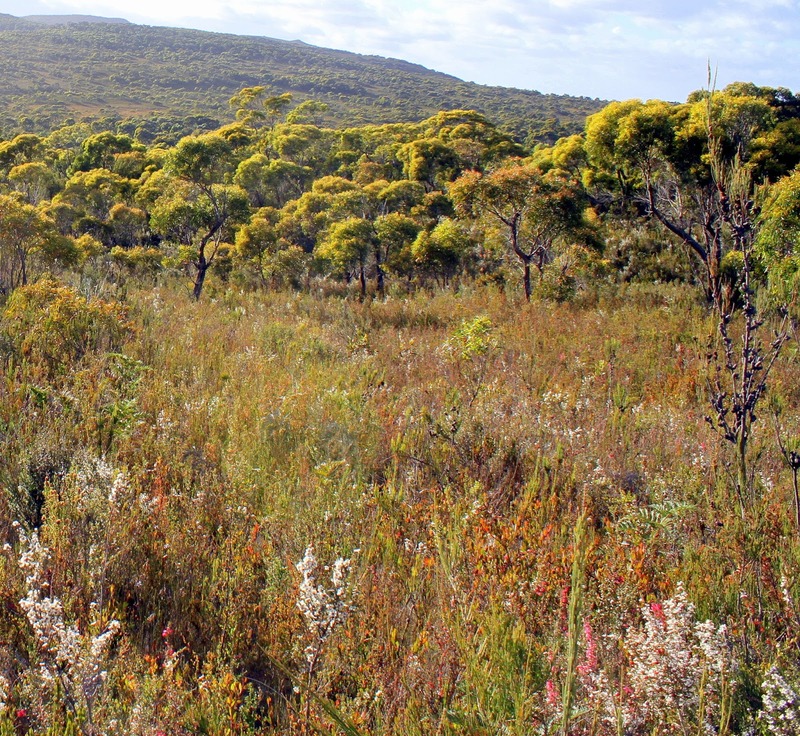 On several morning walks I flushed several Eastern Ground Parrot, although be prepare for a bit of hiking through boggy heath – my shoes are still wet – for ease of access look for areas with knee-high heath, the best length for seeing Ground Parrot. Tasmania’s other heathland specialists were all common here, such as Southern Emu-wren (ssp litteri), Beautiful Firetail, Striated Fieldwren, this is the western Tasmanian ssp diemenensis, another Tasmanian ssp fuliginous occurs on the east side of the island, Tawny-crowned Honeyeater, Brush Bronzewing and Olive Whistler – on one particular walk I must have seen / heard at least twelve seperate Olive Whistler. The heathland along Macquarie Heads Rd, which runs off Ocean Beach Rd immediately before you reach the airport, is also pretty. Ocean Beach, quite naturally at the end of Ocean Beach Rd, held Red-capped Plover, and Australian Pied and Sooty Oystercatcher, and the shoreline scrub here contains a Short-tailed Shearwater colony. Young Dusky Robin waiting to be feed, Jetty Beach. The other “must do” thing in Strahan is to take a boat cruise around Macquarie Harbour and up the Gordon River. It really was excellent, and cruising up the rainforest-lined Gordon River is something to behold. Although I’m not spiritual, standing on the front of the boat gliding slowly up in the Gordon River was about as close you get to a spiritual experience. It’s worth every dollar spent. In the upper reach of the Gordon River, scanning the riverbank, a Tasmanian Azure Kingfisher (ssp diemenensis) took flight and flew up the Gordon. I was pretty happy about seeing colourful little bird, possibly my best bird for the trip. It’s rare in Tasmania, and added further colour to an already colourful experience. Although I didn’t get a chance to visit, the narrow coves of Birchs Inlet on the south side of Macquarie Harbour are said to be worth a visit. Like the Gordon River, it’s only accessible by water transport. Along with Melaleuca, it’s a study site for Orange-bellied Parrot in their breeding range, and birds such as Azure Kingfisher and the other heathland specialists are found there. Note re the boat. We chose the Brown and White boat of World Heritage Cruises. The only logic behind this was that they were a local, family-owned boat who’ve been working the river for over a 100 yrs. Also, it’s worth noting that there’s no need to book premium or gold seats (not that a birder ever would). The standard seat almost identical and, as soon as the trip starts. you can to move around the vessel, where they are plenty of spots for viewing and photography. 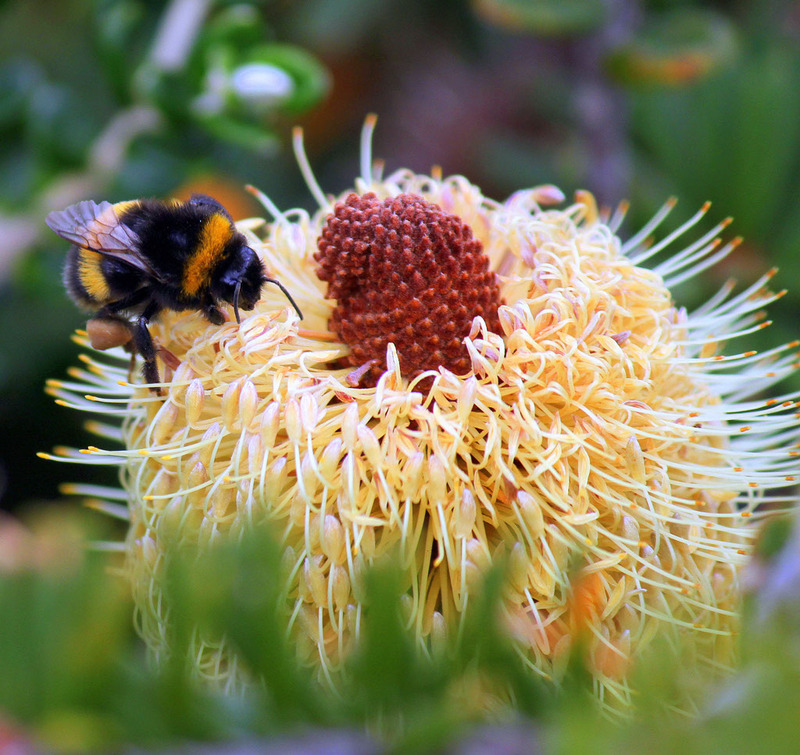 The stunning but controversial Large Earth Bumblebee (Bombus terrestris) feeding on the native Silver Banksia (Banksia marginata). Our penultimate destination in our circumnavigation of the Tasmania was Stanley, a very attractive coastal town on the north-west side of the island 250 km from Strahan. Adjacent to the township is the sheer-sided bluff known as The Nut. It’s well worth a visit. Little Penguin breed on the northern foreshore, and there is also a significant colony of Short-tailed Shearwater with an estimated 13,000 burrows. The day I visited, it was good for sea-birding, seeing Shy and Black-browed Albatross, Australasian Gannet, Sharp-tailed Shearwater and Black-faced Cormorant. Of note, both Peregrine Falcon and Nankeen Kestrel (rare in Tasmania- there’s only an estimated ten breeding pairs) breed on The Nut. I dipped on both, however the white-wash of the Nankeen Kestrel nest can be clearly seen on the south side of the bluff. Another bird seen near Stanley was Latham’s Snipe, flushing a single bird from coastal vegetation near the intersection of the Strahan and Bass Hwys. A word of warning though. Although Stanley is a pretty seaside town, we found the caravan park horrible. Put simply it was full of – I hate to use the word – bogans. Through day and night dozens of … well you know, walked noisily up and down the caravan park, each with a beer in hand. It may have just been the time of year, but we couldn’t wait to get wait to get out of there. When I packed the car to leave a crowd formed, each onlooker with a beer in hand (and it was 10:00am). Heathland, rocky coves and Bass Strait, Rocky Cape National Park. Last stop, before heading home from Devonport, was Sisters Beach and Rocky Cape National Park, 60 km east of Stanley. We stopped to go for a swim with the kids – the beach at Sisters Beach and, nearby, at Beach Harbour, must be amongst the very best in Tasmania, equal to the beaches at Binalong Bay and Bicheno. After a swim, I managed to sneak off for a couple of hours and do a couple of walks in the neighbouring Rocky Cape National Park. Although relatively small, just over 3000 hectares, the park protects an picturesque coastline with rocky coves, stunning sheltered beaches, heathland and Banksia-covered hillsides and there are sweeping views across Bass Strait. The park also has a long history of continual human habitation, dating back for at least eight thousand years to when Bass Strait settled at its currently sea level at the end of the last Ice Age. While walking the parks sandy tracks, Dusky Woodswallow was the most common bird. Being migratory, this may have been a slight anomaly in terms of timing and place, however so many Dusky Woodswallow was intriguing. They were actually more at Rocky Cape than anywhere I’ve seen in Victoria. It may just have been a good year, the time of year, or the location (in terms of migration paths), but I never would have guessed this. A similar intrigue for me occurred with Tree Martin. Again more common in Tasmania than in Victoria. White Gum woodland, Peter Murrell Reserves. Some of the other birds seen at Rocky Cape included White-bellied Sea-Eagle, Short-tailed Shearwater, Kelp and Pacific Gull, Black-faced Cormorant, Australian Pied and Sooty Oystercatcher, Yellow-tailed Black-Cockatoo (the parks logo), Galah, Green Rosella, Eastern Spinebill, Crescent, Strong-billed, Yellow-throated, New Holland and Black-headed Honeyeater, Little Wattlebird, Tasmanian Thornbill, Golden Whistler, Satin Flycatcher, Australasian Pipit and Beautiful Firetail. I’d read somewhere that Painted Button-quail had been recorded in the park. Looking around I noticed a couple of areas of platelet-like scrapings. Perhaps they are here. Rocky Cape National Park is interesting in terms of its plants. The hills overlooking Sisters Beach are dominated by old growth Saw Banksia (Banksia serrata). Aside from a small population (of about 80 trees) on Flinders Island, this is the only place in the Tasmania where this tree is found. The dry forest in the park are dominated by a Tasmanian endemic, Smithton Peppermint (Eucalyptus nitida), while other interesting plants in park include Grass-tree (Xanthorrhoea australis), Spreading Guinea Flower (Hibbertia procumbens), Manuka (Leptospermum scoparium), Scented Paperbark (Melaleuca squarosa) and Coast Beard-heath (Leucopogon parviflorus), sometimes known Native Currant. Tasmanian Christmas Bell (Blandfordia punicea) were also here. Nice to catch up with them again. I kept trying to count the spots. Forty spots is diagnostic isn’t it? It was great to start the trip by revisiting Fern Glade in Burnie. The first thing I noticed was how good my memory of the place was. For some reason, I remembered every corner, every tree and every bird. This was most likely because it was the first place I ever went birding in Tasmania, and there was a potential for a new (endemic) bird around every corner. As a result my mind was in that “ultra-aware birder-birdwatching” mind state, and consequently every memory came flooding back – including that Platypus over there. What a perfect way to start my trip to Tasmania. Jetty Beach on Bruny Island is a fabulous bush campsite where the most common bird is Dusky Robin. It was fabulous just to sit and watch these gorgeous birds moving around, finding food to feed their young. On complete opposite sides of the island, Bicheno and Strahan are both stunning. I could go on. I’m always surprised how many birders think that when visiting Tasmania it’s a race to see how quickly you can see all of the endemics. This may be missing the point. Dare I say, Tasmanian’s a great place to spend with family and friends. From a birdwatching viewpoint, visiting Tasmania is all about its habitats – its coastal birds, its heathland birds, its woodland birds and its cool temperate rainforest birds. So, from Platypus and Bergmann’s rule, to Bumblebees and the laws of aerodynamics, Tasmania has a lot to offer. 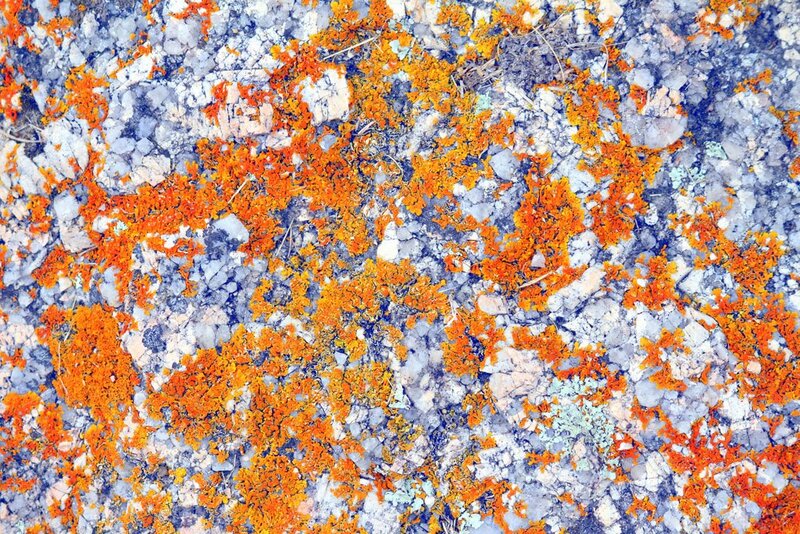 Basically it’s an island of colours – orange, green and blue. Visiting Tasmania is about visiting its ‘wild places’. And eating cherries.